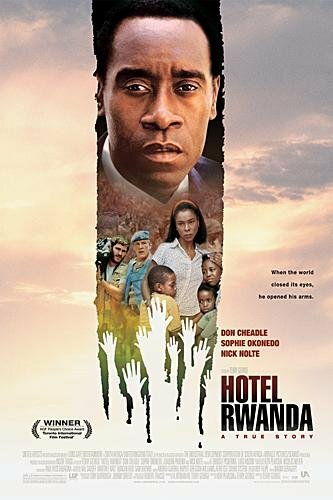 Plot: A hotel manager tries to save the lives tutsi refugees while the Hutu militia take over Rwanda. A realistic depiction of not only the conflict in Rwanda, but the reality of apathy in global politics. Don Cheadle does magnificent job in being not only a family man, but one who answers the call to save others when they looked to him for help. A story that doesn't quite have a feel good ending, but in the end does make you consider the reality of countries that continue to have ethnic struggles to this day. Don Cheadle gives a human and believable performance as Paul Rutabaga and the film captures an inspiring true story with a documentarian approach. With such inspiring material, it's hard for the film not be moving, but the inherent worth of the story is backed up by stellar acting and some inspired photography. It's hard to rate movie like this. It was a really good movie but it was also very sad. In 1994 Rwanda faced a genocide of massive proportions due to an instable political environment. It is estimated that nearly one million people were slaughtered. This film places you right in the middle of it, as Don Cheadle plays Paul, a hotel owner who finds himself sheltering those who are targeted for death. The film depicts how large the conflict was and how the international community turned its back on Rwanda and left its citizens to die. Extremely powerful and uplifting, Paul shelters over 1000 refugees in his hotel and desperately tries to keep them alive. No posts have been made on this movie yet. Be the first to start talking about Hotel Rwanda!